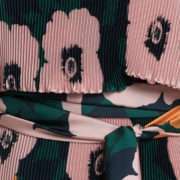 Kevan Jon Momo flower print multiway maxi dress. That wonderful flower power print makes the dress so eye catching. But what you will fall in love with is its versatility and effortless glamour. 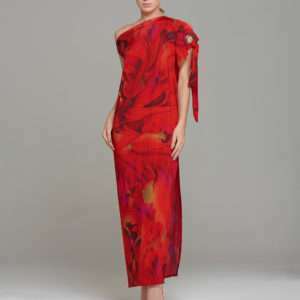 The fabric is stretch stain ribbed crepe so its light and will drape and shape in all the right places. We had fun with this dress showing you all the ways to wear it using the tie sash – strapless tied around waist, wear as a scarf, turn into halter and many more. The fabric is so great it needs no ironing and that’s always a plus.